Will we score enough points? Yes. We’ve been spoiled by having the most efficient AND fastest offense in the country over the last few seasons. This year we are just fast. If you can manage to avoid comparing this team to the Lawson-Hansbrough teams then this one will look pretty decent on offense. We are dominant inside and 63% of our points are from two-point shots. We can shoot the three. Our average PPG is just over 83 and the only thing holding our efficiency ranking in the mid 40s is turnovers….which I’m going to get to. Is John Henson the real deal? Not in 2009. I’m not writing him off yet. He is not what a lot of Carolina fans expected. He plays tentatively and mixes in amazing blocks and dunks with awful shots and passes. I do think that Henson is a perfect player for this system. He’s a fantastic athlete who should be galloping up and down the floor, slamming and rejecting every basketball in reach (which is almost all of them). His jumper and poise might come later this year, next season, or not at all; but he has a lot of value out there. I’m pretty sure his lack of minutes is tied to his poor offensive play, but this guy is the second best defensive rebounder we have and the only guy who can guard Kyle Singler types. He’s going to need more than 11 minutes a game to help us out. Why isn’t Z playing more than 16 minutes a game? This is not about Deon. Deon is a very good player. Any college team would love to have Deon Thompson. I’m quite happy to have him and when Deon is rolling, so are the Heels. People say he is soft or whatever, but that is shite. He’s tough enough and he works hard every game. What I’m about to blog has nothing to do with Deon. It is not his fault that Z is better. Tyler Zeller comes in, dominates for three minutes and then sits back down. I have yet to see anything about Z that makes me understand why he does not play more. He should have been in the game during OT on Monday and he should be getting the ball often when he is in the game. I’m not saying Deon needs to sit, but if you have to split minutes between D and Z, then you have to give more to Z. Why isn’t Ed Davis a major contributor? Can anyone answer this? Once again, no disrespect intended to a very good Deon Thompson. But…ED DAVIS IS A BEAST. Yes, I too have been very disappointed with his missed layups that seem to happen only at crunch time. Nonetheless Ed’s eFG% is 64.7! To put that in perspective, Psycho T’s was 52.4 last season. That Deon is taking almost 30% of our shots while Eddie take less than 20% of our shots is driving me crazy. If I had to point to one thing….this would be it….just give 10% of Deon’s shots to Ed and 10% of Deon’s minutes to Z. In my opinion, Carolina becomes a much better basketball team if this happens. The stats have my back. I should not have to say this. I’m just a guy in his mom’s basement, typing out suggestions in my underwear. In Roy I trust. Roy knows more about dag gum basketball than I do. It isn’t worth discussing, OK? Many great coaches will take their players and then fit them into a system that gets the best out of them. Other great coaches will take their players and mold them into the system they want to play. Neither way is beyond reproach. 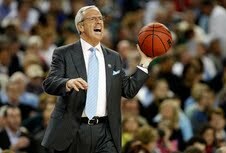 Say you think UNC is not good enough to win it all this year? This is a reasonable opinion, yes? Would we not be better off, losing a few extra games trying to learn this system that has brought us so much entertainment, not to mention titles? Next season Dexter and Larry will have learned to play faster and perhaps Kendall Marshall will be the missing piece? On the other hand, maybe this team does have enough to make a real run at it? Perhaps, this team’s flaws have more to do with the way we are trying to play? Maybe we don’t have a rotation yet because Roy can’t find the parts to make the secondary break basketball that has been so rad and efficient work like it should? I don’t have answers to these questions. I will say that we are very tall, effectively the 4th tallest team in the nation. Yet this very tall team is not dominating the defensive glass, ranking 119th in defensive rebound percentage. This very tall team is not getting a lot of steals and this very tall team is turning the ball over way more than it is creating turnovers. I really expected this team to be amazing on defense, but it has yet to happen. Last year’s defense was better. Maybe we should not be playing at the 7th fastest pace in the country. Maybe we should be crashing to boards instead of getting a step on the fast break? Maybe the turnovers would drop if Marcus, Dexter, and Larry were not making decisions so quickly. Perhaps Carolina would be much tougher on both ends if we slowed down a bit. Or maybe we’d just look worse on offense, force more turnovers and make less layups. I can’t say for sure. It might be worth considering though. Overall, I’m not sure we should be too disappointed. This team is extremely young and has played a tough schedule. I’m just as frustrated as anyone. I don’t understand why the team can go on huge scoring runs and then follow them up with long droughts. I don’t understand why this team always has to help off of three point shooters with the big boys we have. I don’t know why nobody boxed out Dexter Pittman. I want our senior to know he should foul in the final seconds, up 3 with fouls to give. I don’t know why our best player does not lead the team in shots or why he does not get the ball when we need a basket. See, I’m losing the point of this paragraph just thinking about those bone-headed last minutes on Monday. It is easy to lose perspective. The point is that we all knew that this might be a down year, a re-building year, or whatevers. We are 11-4. We have a very good chance to make the tournament. Absolutely nobody will want to see us in their bracket. Dook looks good, but I think we can play with them. Not bad for a down year, right? Let us try to be patient with Roy and the 09-10 Tar Heels. I trust that they’ll continue to find answers. Swapping Danny Green for Marcus Ginyard was not the wash that some expected, given that Ginyard started in 2008. Henson (and perhaps Strickland) is underwhelming, and Zeller does not seem to be getting the minutes he should, as you mentioned. Davis’s stats look perhaps better than they really are. Three of his biggest games have come against weak opposition and he doesn’t seem to control the paint on either offense or defense with the kind of authority that UNC needs. I don’t think UNC is doing all that bad considering. 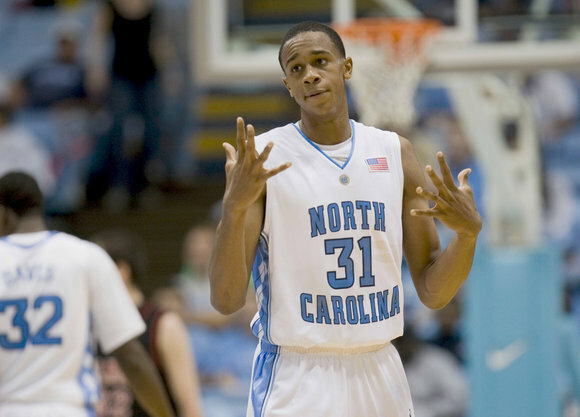 2006 is simply creating greater expectations, as have Roy’s recent recruiting spoils, with him bringing in Marvin Williams, Tyler Hansbrough, Brandon Wright, Wayne Ellington, Ty Lawson and Ed Davis since he arrived in Chapel Hill. That is six seasons and six impact freshmen during that period. Who knew there would be no impact freshmen of that caliber this year? If we added a Lawson, Wright or Hansbrough to this current squad, they would be pretty damn good as well. Unfortunately, UNC might have had a similar overranking with our current here that Duke’s class that had Paulus and McRoberts experienced–nothing wrong with that Duke class, it just wasn’t as good as touted. Hansbrough and Danny Green turned out to be better than expected from 2006 and Paulus and McRoberts turned out to be not quite as good as expected. It happens. A lot.